In a normal world, during a normal late fall and winter, cold air would concentrate over a thick northern ice pack near the North Pole. The sea ice would be dense enough, unbroken enough, to lock a warmer ocean away beneath. The cold air core would be encircled by strong winds — both in the upper levels and at the surface. An atmospheric cold zone that would tend to be pretty steady, taking strong weather anomalies to drive it off a firm base of chill air. In today’s world, the Arctic Ocean is warming. Connected to an also warming world ocean, the waters provide a launching platform for the added, human-driven heat. The surface sea ice is thus far thinner — containing less than 50 percent of the volume it boasted during the late 1970s. And, during this time of year, an extraordinary overburden of greenhouse gasses (primarily CO2 and Methane) continuously traps extra long wave heat radiation throughout the dark winter night. All that extra heat gathering over the Arctic Ocean makes the cold air core far less stable. More and more frequently it is driven from its previous haunt near the North Pole. A climate change refugee looking for a cold air pool as temporary asylum from the inexorably building heat. To the south, the still solid but increasingly endangered ice sheets of Greenland provide, perhaps, the most likely haven. 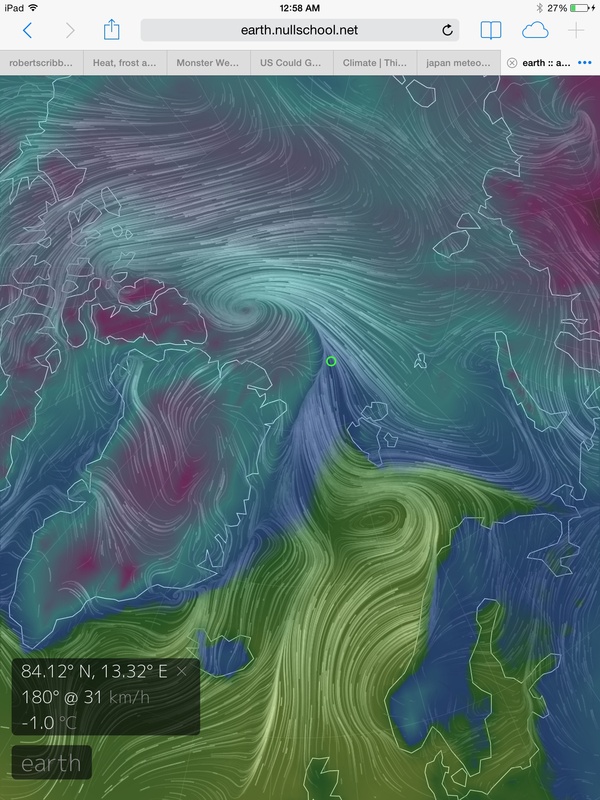 So as the high Arctic heats up, the cold air re-centers over Greenland. And the result is a rather odd configuration in which atmospheric currents begin to displace southward, encircling Greenland rather than the polar regions. A disruption that results in a ripple of changes throughout the Northern Hemisphere — including serious alterations to the storm track and a far greater likelihood of the extreme weather producing planetary wave patterns. The above described scenario draws from a number of cutting edge scientific theories. The first is Hansen’s Storms of My Grandchildren theory — in which a combination of polar amplification and enhanced Greenland melt drive severe changes to the Northern Hemisphere storm track, resulting in nightmarish weather. The second is the enhanced planetary wave theory, proffered by Dr. Jennifer Francis, in which Arctic warming drives severe changes and distentions in the Northern Hemisphere Jet Stream. The two theories are related in that Arctic warming, in both cases, is a primary driver of extraordinary climate and weather changes. Thus far, we have seen growing evidence to support these theories, especially Dr. Francis’ theory, as ever since the mid 2000s we have observed an increasing prevalence of weak Jet Streams, strong planetary waves, and powerful meridional flows driving warm air into the polar zone, but also driving cold air out. Hansen’s Storms of My Grandchildren theory got a boost last year as a southward shifting cold air circulation ignited a powerful North Atlantic storm track that set off the roughest winter on record for England and the UK. This year, we see similar weather phenomena related to these theories. The inundation of Buffalo with one year’s worth of snowfall in just two days was driven by a powerful planetary wave pattern directly associated with polar warming. A similar planetary wave is, today, threatening to dump more than a foot of snow across regions of the US Mid-Atlantic through New England. A January type winter storm on Thanksgiving that was preceded by 70 degree temperatures. In the above image, provided by Earth Nullschool and collecting data from US based global climate observations and models, we find warm air from the subtropical Atlantic being driven northward by first a mid-ocean high pressure system and then by a powerful low raging away off the southern tip of Greenland. The warm air flow rises north then joins with a continental flow rising off of Europe to cross the North Atlantic and the Barents Sea. Traveling along a cold frontal boundary sweeping out from Greenland, the warm air current surges up over Svalbard and toward the North Pole. This extraordinarily warm air then becomes entrained in another low north of Greenland before following a polar air flow driving down over the Canadian Archipelago and Hudson Bay. A powerful north-south flow drawing over Baffin Bay into the strong low south of Greenland closes the loop. Thus we find Greenland encircled by winds, its cold air core far offset from the pole as the region over the Arctic Ocean warms. 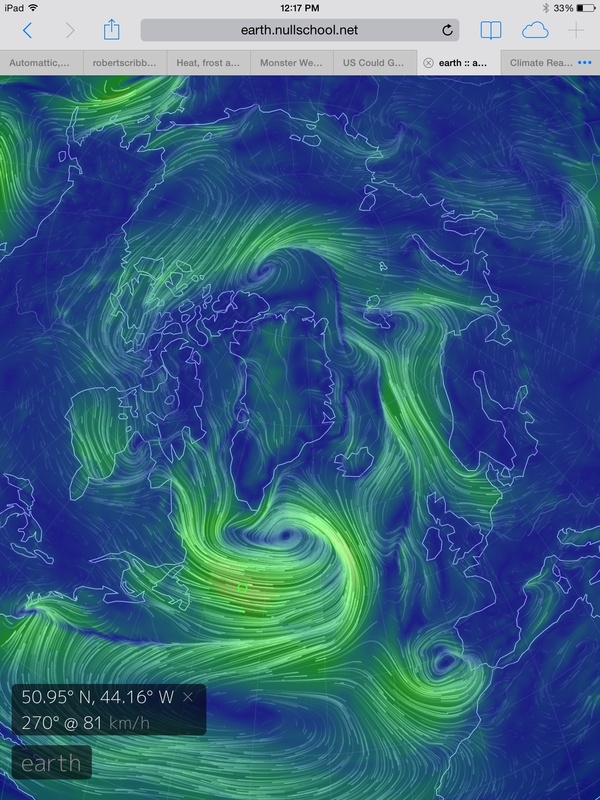 As we can see in the surface wind map (top map), the surface air flow is running a complete circuit ’round Greenland. The result is that the cold air core driving NH atmospheric circulation at the surface is now centered over Greenland and Baffin Bay. It is displaced many hundreds of miles south of the North Pole. And the North Pole itself has become over-run by a warm air flow at the periphery of the cold air circulation’s center. Upper level wind patterns are similarly disrupted with a cold upper air low churning away over Baffin Bay and a second cold core circulating over Central Siberia. In both cases, in the upper levels near the Jet and at the surface, the region of the Arctic Ocean is disassociated from the cold air centers and related atmospheric circulation. A set of conditions that has come to very well resemble those predicted by Dr. Francis, or worse, look more like a precursor to Hansen’s Storms of My Grandchildren scenario. In this case, for today, the weather observations match the warming-induced pattern just as predicted. Mainstream meteorologists, including those at the Weather Channel, continue to cover current weather as if it is occurring under traditional conditions while only providing sideways references to cutting edge science related to observed atmospheric warming. A new subset of the science that provides much greater insight into what may actually be happening and is a very useful tool for weather prediction in the currently altered and radically changing climate state. Unless such meteorologists begin paying attention to the anomalous changes that are plainly visible in the observational data (changes that I have no trouble finding and identifying after reading the science provided by Hansen and Francis) they will be left behind by events that are increasingly dissonant to their current institutional understanding. A cautionary tale that European meteorologists, baffled by failures of climate models to predict record floods from training of low pressure systems into Morrocco off a persistent and anomalous dip in the Jet Stream this week, can bear testament to. Like geologists who failed to take into account for plate tectonics theory in the mid 20th Century, meteorologists adhering to old weather prediction methods risk becoming outmoded and less relevant to current, and rapidly evolving, climate realities. The new global warming science both bears out in the observational data and in its usefulness to predict extreme events — so, for the sake of accuracy, it needs to be included.